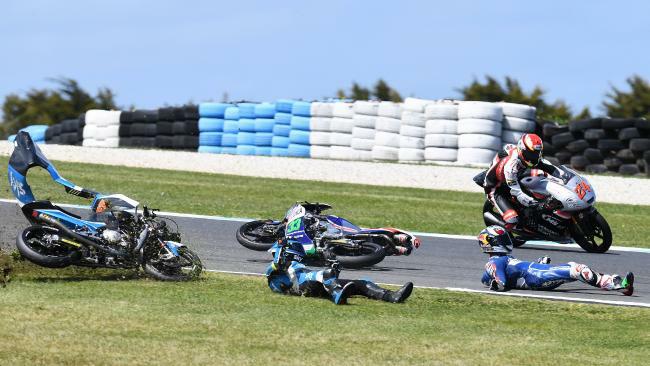 Motogear | MotoGP, Phillip Island: Red flagged race causes lots of commotion, but luckily- no injuries! Nolan Group riders have tried hard in Australia, despite enduring a weekend marred by an unexpected and very unfortunate crash, luckily despite the force of the crash, nobody was seriously harmed. The Moto3 race was unfortunately afflicted by multiple crashes which sadly took frequent podium winner, Enea Bastianini, out of the race. The race was sadly red flagged and caused 10 riders to fall out of the running. The crash started when John McPhee (Peugeot MC Saxoprint) lost control of his bike and hit the floor thereby causing a knock-down effect on those around him. Bastianini could not escape the on-coming debris as he tried to regain contro. Enea was rushed to hospital but we are pleased to report that the Nolan/X-Lite helmet has done its job perfectly, even if the circumstances were undesirable. In Moto GP, there was (as usual) maximum performance from both Danilo Petrucci, who came 9th and Stefan Bradl (11th) . Next race: Malaysia, hoping for better weather and more generous races!